I recently found myself drawn into a debate (more like Twitter war) on the subject of eugenic abortion. Eugenics refers to the practices and ideas revolving around the concept of “improving the human stock,” as in, animal husbandry but for people. Eugenic abortion is the effort to terminate children-in-utero because they have some quality or trait deemed a “defect.” My post was originally inspired by a recent Politico article which suggests expanding access to late term abortion because of the Zika virus. Here was my original post. And so began roughly a hundred comments between us about what exactly is “eugenics,” and about whether there is such a thing as “eugenic abortion,” and how genetics relate to the subject of eugenics. Now you can imagine how awkward and cumbersome it was to try to address this complicated and weighty issue in sounds-bytes of 140 characters or less. I soon excused myself from that conversation and devoted my energies to a more serious extended response, linked below. For those of you familiar with the subject of eugenics then you may not be surprised at my course of argument in the linked article. But for those of you who are not familiar with the subject of eugenics, or the interplay of family planning, abortion and contraceptive policies, and their historical interaction with the shady character of eugenics, then the following article may surprise you. If this is the first time you are encountering the notion of eugenics then I strongly encourage you, after perusing my post, to check out some other sources on the history and impact of eugenics. “Abortion and Eugenics” [Webpage], curated at MIT, n. d.
John West, Darwin Day in America, ISI, 2007. Edwin Black, War Against The Weak, Dialog Press, 2012. Cold Springs Harbour Laboratory, Eugenics Archive [Website], n.d.
What fallacies? At this point, I’m not even sure what you think I’m doing wrong. The whole time we were talking on Twitter I was getting the distinct impression that you were mischaracterizing my view and my claims and then faulting me for failing to prove those mischaracterized claims which I was never making. For the sake of communication, please spell out what you are claiming–which apparently opposes my claim/s in this article. And state what you think I was originally claiming regarding the relation between Zika/microcephaly abortions and eugenics. That would help me understand what your objection is. At this point, I just don’t understand what your objection is. As for my central claims and intentions, I demonstrated that there has been a broad sense of the word “eugenics” prominent in the late 19th and early 20th century and which seems to still persist today, at least in some regard, even if there also exists a “narrower” sense of the term which focuses entirely on genetic heritability. At this point, i don’t know why you are objecting since I’m not dismissing the narrower usage which a legitimate use of the term, and you have not disproven or undermined the broad usage which I’ve demonstrated. As such, it’s entirely fair and well-informed to assert that it would be a brand of eugenics (broad sense) to abort “defective” microcephaly babies as they would be perceived as an undue burden to their family or, within socialized medicine, welfare, and other tax-subsidized programs, they’d burden the rest of society too. I also demonstrated that the debunked pseudosciences affiliated with eugenics (i.e., scientific racism, phrenology, etc. ), and the defeated legislation affiliated with eugenics (i.e., forced sterilization programs) were never intrinsic or necessary to the concept of eugenics. Even when those attempts at science were debunked, or those laws were overturned, the broad concept of eugenics never died. It was never formally or finally replaced but was rather supplemented by a narrowed sense (as you seem to understand the term). 1) Category error. You are confusing infection with inheritance. These are biologically distinct concepts. 2) Red herring and Straw man. You have implied that I have taken the position that “abortion is not eugenics,” and sought to disprove that position. It is both not my position, and irrelevant to my original criticism. You have not demonstrated that there is a “broad sense” of the term eugenics, even in the 19th century, that included in utero infection like Zika. Even if you had, it’s irrelevant, because that sense does not exist today, outside of your own peculiar insistence. I have cited modern medical dictionaries and literature that make it explicitly clear that eugenics has to do with eliminating genetic disability, not infections. You have not contradicted these, and until you do, your case will remain unproved. 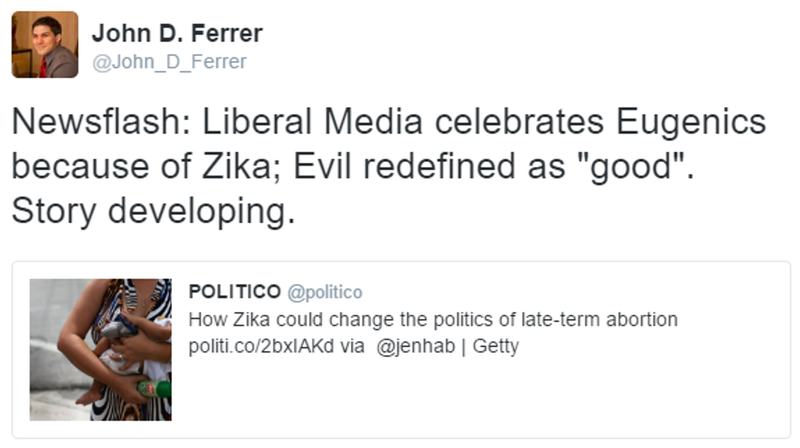 Your original tweet, which is what I objected to, reads as follows: “Newsflash: Liberal Media celebrates Eugenics because of Zika; Evil redefined as “good”. Story developing.” This linked to a story on Politico about how the microcephaly caused by Zika infection could change the moral calculus of late-term abortion. Nowhere in the Politico article, nor in the tweet made by Politico, is the word, “eugenics,” used. That word was ONLY used by you, in your tweeted commentary of the story. That is to say, the only reason we are talking about the relationship between Zika infection and eugenics is because YOU made that claim. My tweet in response was simple: “Not “eugenics,” since Zika infection is not a genetic trait.” That was a correction, not of the Politico article, nor even of your criticism of abortion in response to Zika infection. Instead, it was a correction of your mistaken assumption that aborting a fetus for any kind of birth defect constituted eugenics. I thought that I had made it clear that you were making a category error, not between eugenics and abortion, but between eugenics and infection. Based on your continued responses and bafflement, I’m still not entirely sure that you have repented of your error. But as long as you continue to make it, I will correct you. Zach, I addressed a broader family of problems instead of just your position. Instead of trying infer my intention please just read the article for what it says. As for the category error, biology does not have the market cornered on all uses and theories regarding the term inheritance. Indeed eugenicist like Woodrow Wilson and George Bernard Shaw treated the issue of eugenics in terms of social burden and sociological patterns. If you’d prefer I use a different term besides inheritance I guess I could do that but then I’d run the risk of anachronistically interpretating the historic uses of the term. You haven’t proven that that there’s only one narrow homogenous usage hovering strictly around genetics. That’s ONE use of the term but that’s not the only one and I’ve proven as much through several lines of rebuttal. Even after the onset of modern genetic theory many eugenicists still treated “defects” as a wide range of problems besides just genetically heritable traits. Hitler wasn’t strictly concerned with genetics but used the social burden argument to eliminate sick and infirm people regardless of genetic makeup since they were deemed a burden to society. BTW, do you support eugenics at least in the most evolved modern sense (ie, no phrenology, or scientific racism included)? It sounds like you are trying to isolate eugenics today from its historical baggage as if it’s most basic concept from the outset (ie, “improving human stock”, borrowed in total from animal husbandry) somehow now refuses to call “defective” any drastic deformities, handicaps, and physically affective diseases so long as they aren’t genetically transmitted. I just don’t see that permissiveness anywhere among the actual advocates of eugenics. John, it’s precisely what your article says that is the problem. Even in this preview, you continue to make the straw man fallacy, when you say that I was arguing “about whether there is such a thing as ‘eugenic abortion. '” I did no such thing. Biology absolutely does have the final say on biological concepts, such as inheritance and infection. When non-biologists are allowed to infer anything they want about these concepts, and introduce non-scientific meanings, in addition to the category error that you have made we have situations such as the witchcraft accusations currently endemic in West African countries. The solution, as it is there as it is here, is to refuse to allow people to deviate from the biological concepts as defined by biology. Whether or not I support eugenics in any sense is totally irrelevant to this discussion. Please don’t pursue a rabbit trail there because you can’t defend yourself here. If you had written a different article, I would be happy to have commented on that subject.